Since March 2014, Google Analytics has been fully available in AdMob, and now app developers are increasingly seeing results by combining data from both platforms. Here’s one story that illustrates the power of AdMob and Google Analytics together. Jason Byrne, and business partner Robert Diem, are passionate about making a difference in education. They came together during their time as professors in Japan to found Eltsoft LLC, a company that builds mobile language learning apps for iOS and Android. Together, they started creating a series of fun tools that allow users to study whenever they want, wherever they are. Their most popular app is English Grammar, which has been downloaded by more than a million people looking to sharpen their English-language skills in nearly 120 countries. All of the company’s apps are available for free or as paid versions. To increase revenue, they chose AdMob to earn money from the free versions of their apps with advertising. “AdMob monetization is central to our success because it delivers high-quality, appropriate ads to our audience in their native languages, wherever they live,” says Jason. The Google Analytics data within AdMob helped them understand more about their users. "Our app, English Grammar, has users from all around the world, so we turned to data from Google Analytics and AdMob to understand which languages we should consider for localization. For example, we knew we had to prioritize German and French, but we discovered other languages that we didn't expect, such as Russian and Japanese." Eltsoft has developed a way to calculate the value of users by using a combination of AdMob metrics (like ad request values) and Analytics metrics (like user counts and sessions per user). Having Google Analytics in AdMob has unlocked such analysis because the data is available in the same interface. “Google Analytics data is literally a goldmine,” says Jason. If you want to learn more about how Eltsoft is using Google Analytics and AdMob, download the full case study. Want to learn how to get the most from Analytics in AdMob? Sign up for our free online course, Mobile App Analytics Fundamentals. of how people behave before and during the Thanksgiving holiday in the US. We saw the most important days of the year for retailers, how to take advantage of the top transaction days, and when to take action. Today we are looking at the patterns of behavior over the holidays and into the new year with the objective of understanding how digital marketers can prepare for 2015. Read on to learn more about the analysis we performed and how to take advantage of the trends we found, it will help you get a head start on 2015! 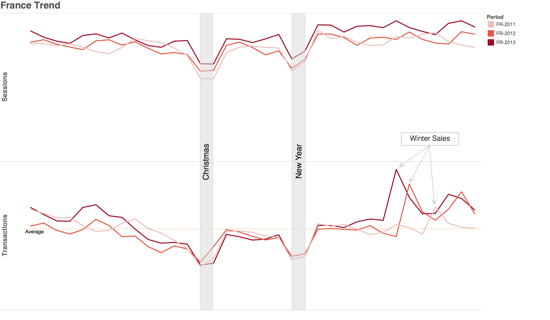 Patterns can tell us a lot about data, they are intuitive and show us a lot of information at a glance. 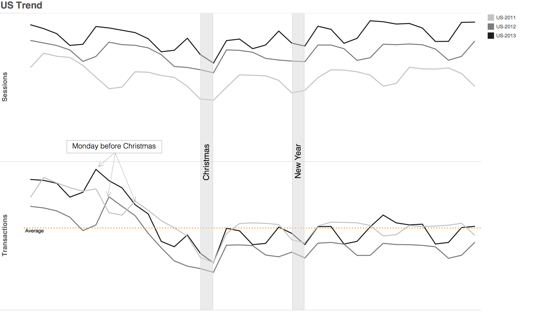 With that in mind, we produced the charts below to show how people behave around Christmas and New Year’s Eve. We wanted to understand the differences between cultures, so we focused on the trends from three large economies: US, UK and France. 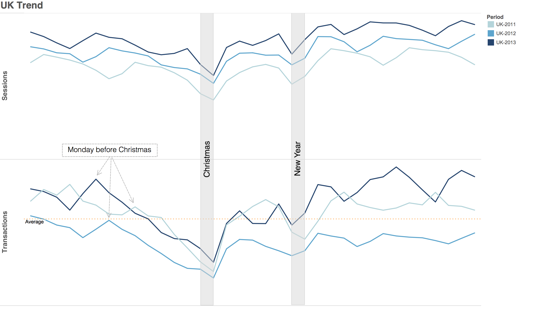 All the charts show data from December 11 to January 14 for the last three years and the two vertical grey areas represent Christmas Day and New Year’s Eve. United States: the transactions trend clearly shows that users purchase mostly up to a week before Christmas Day and no improvement is seen in early January, although sessions do return to normal quickly after New Year’s Eve. Publishers should take advantage of this rebound in sessions, while retailers may want to wait on providing deals until sales bounce back fully. United Kingdom: transactions decline sharply until Christmas and then start rising sharply from December 26, and about a week after New Year’s Eve it raises to levels about the same or higher than pre-holiday, so you might consider creating marketing campaigns and promotions to take advantage of January’s rise. Sessions follow a similar pattern. France: transactions and sessions follow a similar pattern as in the UK, but with a significant decline during New Year’s Eve. As you can see, there is a major spike in the second Wednesday of January every year, that’s the day Winter sales begin in France! Unlike in the US, January is an important month for French retailers, should we say the French Cyber Wednesday? Look at your own data for previous years to understand the patterns for your existing and previous customers. Check your Benchmarking reports to learn more about how other websites of your size and in your vertical performed. Use Google Trends to check trends from previous years related to your vertical and country. 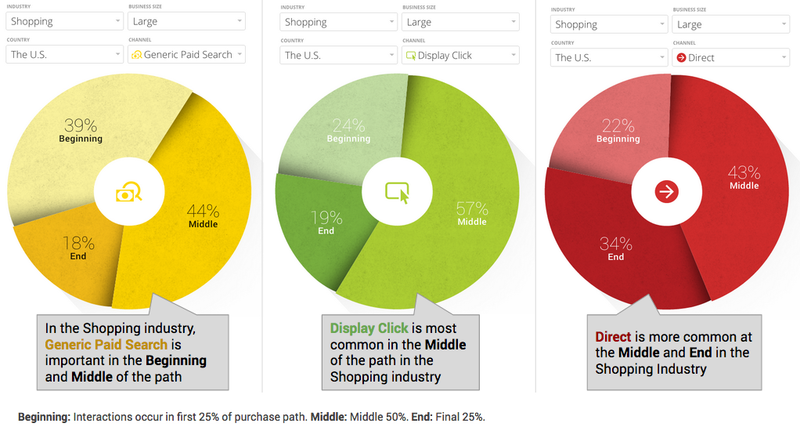 Make sure you match your marketing efforts to your local post-holiday trend. In order to perform this analysis, we looked at billions of sessions from authorized Google Analytics users who have shared their website data anonymously (read more). Last month we published an analysis of how people behave before and during the Thanksgiving holiday in the US. We saw the most important days of the year for retailers, how to take advantage of the top transaction days, and when to take action. DoubleClick Advertiser blog as part of the with DoubleClick series, highlighting stories and perspectives from industry leaders about how they are succeeding with an integrated digital marketing platform. As one of the UK's leading family clothing retailers, Matalan must be nimble -- faster decisions mean better customer engagement and more sales. So they worked with Morpheus Media to implement Google Analytics Premium with DoubleClick Campaign Manager. 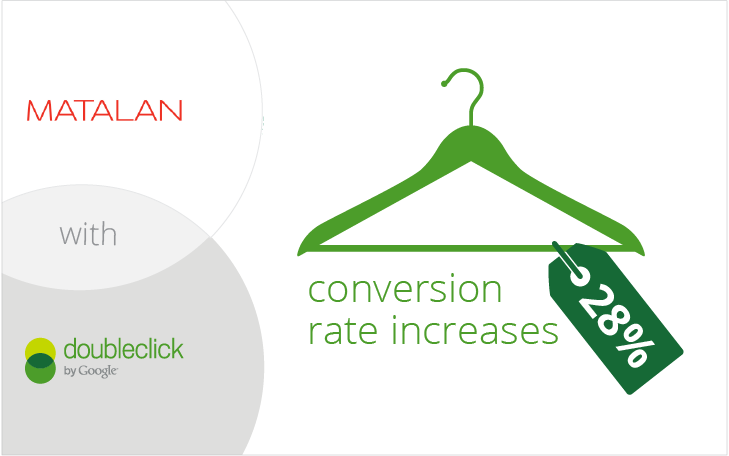 Google Analytics' powerful insights helped Matalan make better business decisions, faster. This post originally appeared on the DoubleClick Advertiser blog as part of the with DoubleClick series, highlighting stories and perspectives from industry leaders about how they are succeeding with an integrated digital marketing platform.